The POE-172 delivers the Ethernet digital data with 56V DC power over the twisted pair cables as a 60-watt Power over Ethernet Injector, and the connected Ultra Power over Ethernet splitter, the POE-171S, will separate the digital data and the power into three optional outputs (12V/19V/24V DC) with distance up to 100 meters. The POE-172 and POE-171S Ultra PoE solutions use the same cabling standard such as IEEE 802.3at/af PoE. Instead of delivering power over 2-pair twisted UTP – be it end-span (Pins 1, 2, 3 and 6) or mid-span (Pins 4, 5, 7 and 8), it provides the capability to source up to 60 watts of power by using all the four pairs of standard Cat. 5e/Cat. 6 Ethernet cabling. In the new 4-pair system, two PSE controllers will be used to power both the data pairs and the spare pairs. 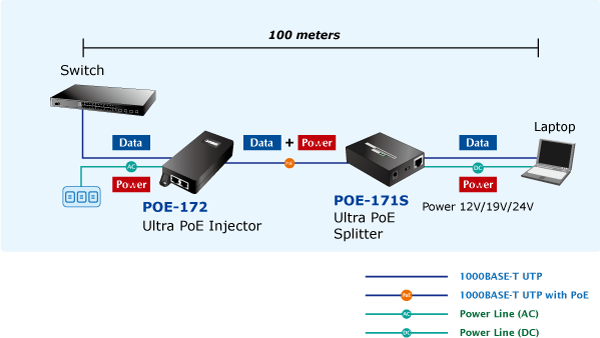 With concepts of "Easy to install”, “Plug and Play” and "Simple troubleshooting" for business and home users, the POE-172 is an all-in-one, single-port PoE+ injector with internal power supply. In the compact size housing, the POE-172 provides one 100-240V AC input socket on its front panel, two LEDs (System POWER and PoE ACTIVE) on the top side and two RJ45 ports (PoE port and LAN port) on the rear panel. Simply plug in the Ethernet cables and power cord, and the POE-172 is ready to provide high-speed network communication and ultra power PoE injector functions simultaneously with no need of software configuration. Backward compatible with both 802.3af and 802.3at PoE standards, the POE-172 allows users to flexibly deploy standard and high powered devices to transfer data and power simultaneously through one Ethernet cable for up to 100 meters. 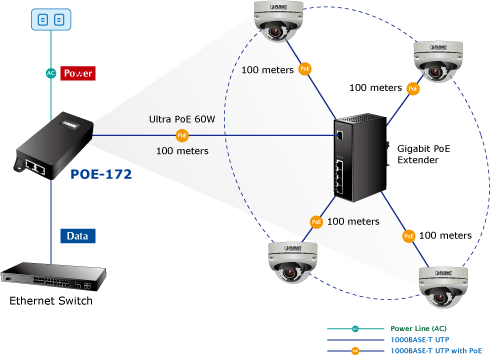 The POE-172 frees the security IP camera and wireless AP deployment from restrictions of power outlet locations and the additional AC wiring. It thus reduces cables and eliminates the need for electrical outlets on the wall, ceiling or any unreachable place, and most of all, it reduces installation time. 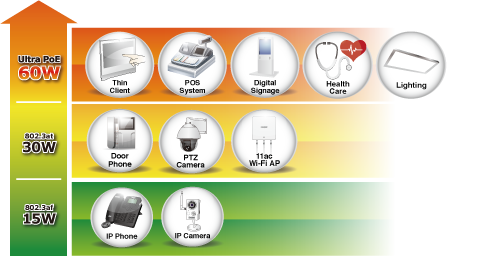 Due to the backward capability of IEEE 802.3at/af PoE standard, the POE-172 can directly connect with any IEEE 802.3at/af end-nodes such as PTZ (Pan, Tilt & Zoom) speed dome network cameras, color touch-screen Voice over IP (VoIP) telephones, and multi-channel wireless LAN access points. For a place which is hard to find the power inlet, the POE-172 and POE-171S operate as a pair to provide the easiest way to power your Ethernet devices which need high power input, such as PTZ (Pan, Tilt & Zoom) network cameras, PTZ speed dome, color touch-screen Voice over IP (VoIP) telephones, and multi-channel wireless LAN access points installed on the top of the building or used in enterprise office or home. Is 100-meter cable long enough for a wide range of IP surveillance deployments? The answer is certainly not. 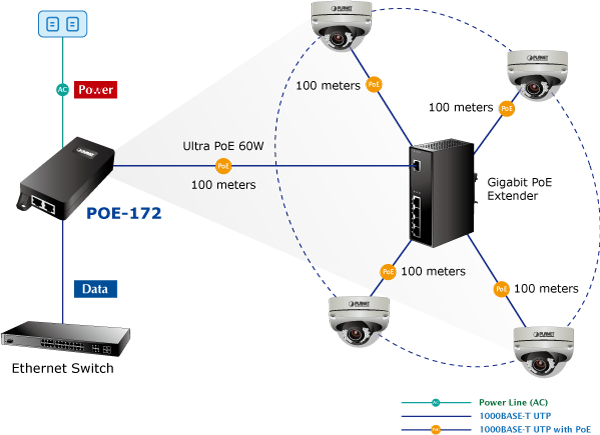 To achieve the benefits of IP surveillance and also the long-distance IP camera distribution, the POE-172 and PLANET PoE Extender,IPOE-E174, can be a quick and cost-effective option. In the simplest application, the PoE Extender enables a PoE IP camera to be installed up to 200 meters away from the POE-172. 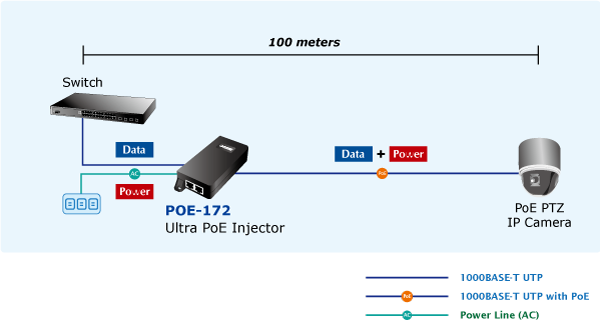 The POE-172 delivers PoE power over the first 100 meters to the PoE Extender over UTP cables, and then the PoE Extender forwards the Ethernet data and remaining POE power to the remote PoE IP cameras.